What's going on with the 2018 Climbing School? Hear the KRSN Interview about the club and the Climbing School. Detailed Schedule | Is Rock Climbing Really for You? The 2018 Climbing School runs from through . Registration must be received by insert-date-here. The class fills quickly with only 25 seats, so early registration is recommended. anyone wanting a chance to tap into the expertise of some of the area's most experienced climbers. 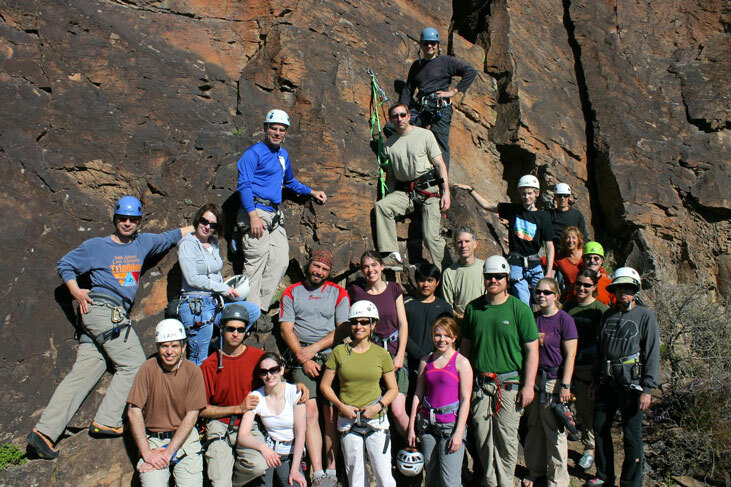 At the end of the class, the students should have a broad overview of important aspects of rock climbing. There will also be some discussion of the extension of rock climbing skills into mountaineering. Students will be able to identify safe and unsafe climbing practices and understand the principles of technical climbing. The overall goal is to orient students to climbing and techniques, so they can gain further experience as they like. We also expect that everyone will have fun! Photos of a typical climbing school can be viewed by clicking, here. The main thrust of the class is to teach the climber to climb anywhere from TR (Top Rope) to Lead climbing on single pitch routes. Leading will primarily focus on Sport Lead, but we may offer some limited Trad (Traditional) Lead instruction and practice. We will always belay from ground. At the end of this class the climber, with a competent partner, will be able to independently climb single-pitch climbs with ratings that are within his/her skill level. Multi-pitch climbing requires more time for more advanced instruction in building anchors, off the ground belaying, rope management, transitions at belay points, and multi-pitch rappelling. The primary text is How to Rock Climb by John Long, latest edition. This text will be provided to the students. All PPT (PowerPoint) presentations used in class will be made available to students from our Google Drive. The outdoor classes will start with heavily supervised top-roped climbing. Further outdoor sessions will include experience with rappelling and ascending, and belaying a lead climber. The final class, the "graduation climb", is an opportunity for students to do a "real" multi-pitch climb following an experienced leader. The emphasis is on safety and fun. Lectures: 6:30 to 8:30 pm, Thursday evenings starting insert-date-here. Classroom is at the Crossroads Bible Church, 97 East Road, Los Alamos. These classes start promptly on time. Please arrive a 15 minutes early to help setup and plan to stay a bit after to cleanup. Indoor Practice Session: Saturday insert-date-here, Los Alamos YMCA, sessions at 9am and 11:30am. Outdoor Practice Sessions: Saturdays (insert-dates-here), 9:00 am to 1:00 pm. NOTE that this is 6 consecutive Thursday evenings plus 5 consecutive Saturday mornings and 1 full Saturday. PLEASE CONSIDER whether your schedule will allow such an intensive itinerary BEFORE you register for the course! We ask that students make a commitment to attend every session; there is little duplication of material from one session to the next, and the techniques taught should be considered the absolute minimum foundation for climbing safely. To graduate and participate in the graduation climb, students must attend at least four of the five outdoor practice sessions, and at least four of the five indoor lectures. Important: See the Detailed Schedule for specific class topics. Students are responsible for verifying that they are in adequate physical condition for the course and will be required to sign a liability waiver. Students must be at least 18 years old (on the first day of class) to participate. Waivers to this age requirement may be requested of one of the Climbing School Directors. Applicants should submit an application form and waiver with payment. The application form with mailing information is available by clicking here for Acrobat. Registration for this course will be accepted by mail, email, or in-person. However, there will be a 25-student enrollment cap. Applicants will be considered on a first come, first serve basis using the receipt date of your payment as the order of acceptance. Applicants who are denied admission to the class will receive a full refund. Applicants may withdraw their application, with a full refund, prior to the beginning of the course. Once the course begins, no further tuition refunds will be made. Questions about the school should be directed to a Climbing School Director; see contact information at top of page. Climbing School w/wo membership. Already a member $200.00 USD. Need a membership $215.00-$220.00 USD, depending if you're buying an individual or family membership. Cost: $200, plus membership ($15 individual/$20 family) for non-members. Nonmembers must become members. Click to BECOME A MEMBER now! All participants must complete a Climbing School Application. All participants must complete a Liability Waiver. You can pay with Paypal, below, or a check payable to the "Los Alamos Mountaineers". If you pay with PayPal, you still have to send in an application form and a liability waiver! Please E-Mail lamclimbingschool@gmail.com to let us know when you have registered and sent the waiver, application form, and check (if you didn't pay by PayPal). This way we know to check our PO Box. Cost includes classroom instruction, field instruction, a textbook, and classroom materials. Personal anchor locking carabiners - can be smaller or same as for belay device. Here are some examples of each of these gear items. There are many, but we'll list a couple in each category here. Modern climbing harness with integrated belay loop: Petzl Corax or Black Diamond Momentum. Dual tube belay device: Black Diamond ATC Guide or Petzl Reverso. Belay locking carabiner: Petzl William or Black Diamond Magnetron. Personal anchor: Metolius PAS or Sterling Chain Reactor or Purcell Prusik (must tie yourself using 7mm accessory cord), and 120 cm nylon sling. Personal anchor locking carabiners: Black Diamond Positron Screwgate or Petzl Spirit Screw Lock. Non-locking carabiner: Black Diamond Neutrino or Petzl Spirit Straight Gate. Helmet: Black Diamond Half Dome or Petzl Elios. Climbing shoes: La Sportiva Mythos or 5.10 Anasazi or Verdon model. LAM does have a selection of Helmets and Shoes that students may borrow for the duration of the course. We recommend that you obtain your own helmet/shoes before the first day of class if you are confident that you will continue climbing. Climbing gear is readily available locally. Both Fusion Multi-Sport (Los Alamos) and REI (Santa Fe) have climbing equipment. Fusion Multi-Sport offers a 15% discount for LAM members. REI has a large selection of helmets/shoes/harnesses. Please contact a Climbing School Director with questions about gear. We will review the required gear at the first lecture. Some used helmets/shoes will be available for loan at the first lecture for those who don't have everything, or (preferably) you can contact one of the Directors to schedule a short (15 minute) meeting at the LAM equipment cage (Arkansas Ave, Los Alamos) to get gear a week or two before the first day of class. Students are encouraged to have their own equipment.